The Red Feedsack: Pfister Faucet or Not? And A Give-Away! Pfister Faucet or Not? And A Give-Away! Today I would like to tell you about my kitchen faucet! When Pfister contacted me to see if I'd be willing to do an honest review in exchange for a faucet of my choice for my new kitchen I was so excited! The only thing I was sure of was that I wanted the Oil Rubbed Bronze finish. 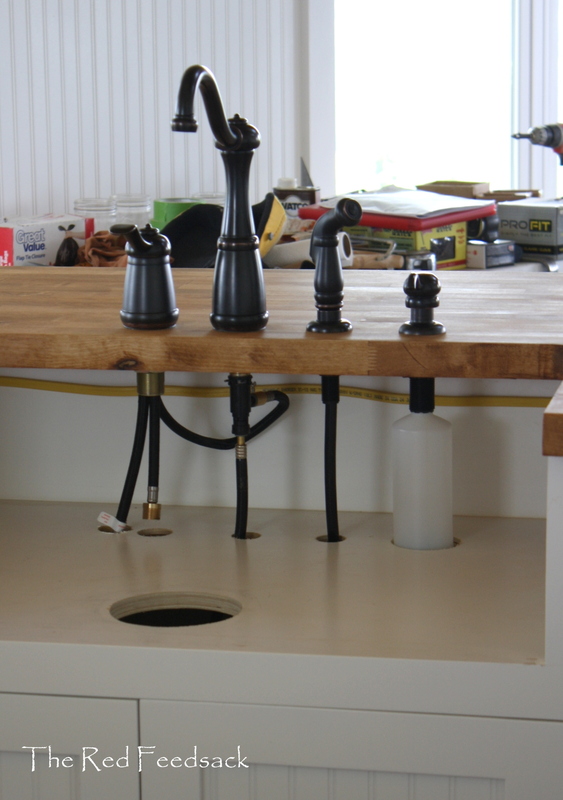 The way our kitchen sink sits in the middle of the huge island open to the living room a beautiful faucet was a must. I kept coming back to the Marielle. It comes in several different variations but the one I chose has a combination of all the things I wanted: high arc gooseneck, separate side sprayer, one water handle and matching soap dispenser. I love it. And I mean, I absolutely love it. Not only does it have all the features I want, but it is incredibly beautiful when you look at it from all the places you can see it: the kitchen, the dining room, the living room and the upstairs! It is the perfect compliment to my apron front sink and my butcher block counter tops. When I told Eldon about the opportunity to get a gorgeous Pfister faucet he said, "I need to see the specs before you choose anything. It has to be a faucet with ceramic valves and seats." So, he read the specifications on the Pfister faucets and was very impressed. They've been making faucets for over 100 years and they know what they are doing. When the faucet arrived and we removed it from the box we were both impressed with how heavy and solid it was. When Eldon installed it using the enclosed instructions he said he was very happy that the instructions were specific to that faucet and not just generic for all faucets. It made it very nice for installing. He was impressed enough with the kitchen faucet that we purchased all Pfister for our bathrooms. One of the best things about the Pfister faucets is their lifetime warranty; not only in function but also the finish of the faucet. 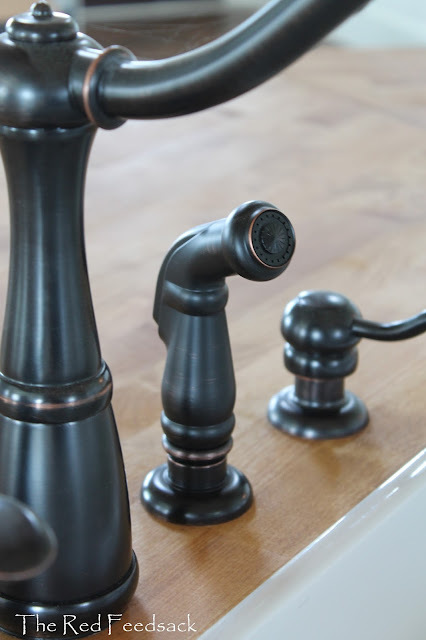 So.... in celebration of my gorgeous new kitchen and my beautiful Pfister faucet, which I highly recommend, Pfister is offering you a free faucet of your choosing, up to a $300 value. All you have to do is click here to visit their site and take a look at all their kitchen and bathroom faucets.... THEN, come back here and leave me a comment telling me which faucet you love the most! I would like to ask that you click here to visit Pfister on Facebook. If you choose to like them on Facebook you will be given a lot of other opportunities to win a faucet. Hope your weekend ahead is perfect! I'll be back next week to announce a winner! Wow. They have an amazing selection. The Treviso, the 2 handle, caught my eye. But to be honest, I'd gladly put any of them in my kitchen or bathroom! I bought all Pfister faucets for our home when we remodeled. I found an ebay store and got great deals! Since I was the one personally installing them all, I was impressed with the specific directions as well. And how heavy and well made they are. After 5 years I am still loving them. Especially the one in the kitchen which is high arched with a pull down sprayer. I love the one you chose!! I love your kitchen. I love YOUR faucet. I love all of the pfister faucets. I don't really know how I would decide were I in a position to do so, but i would definitely go for Tuscan Bronze...probably the Avalon. Love you big! 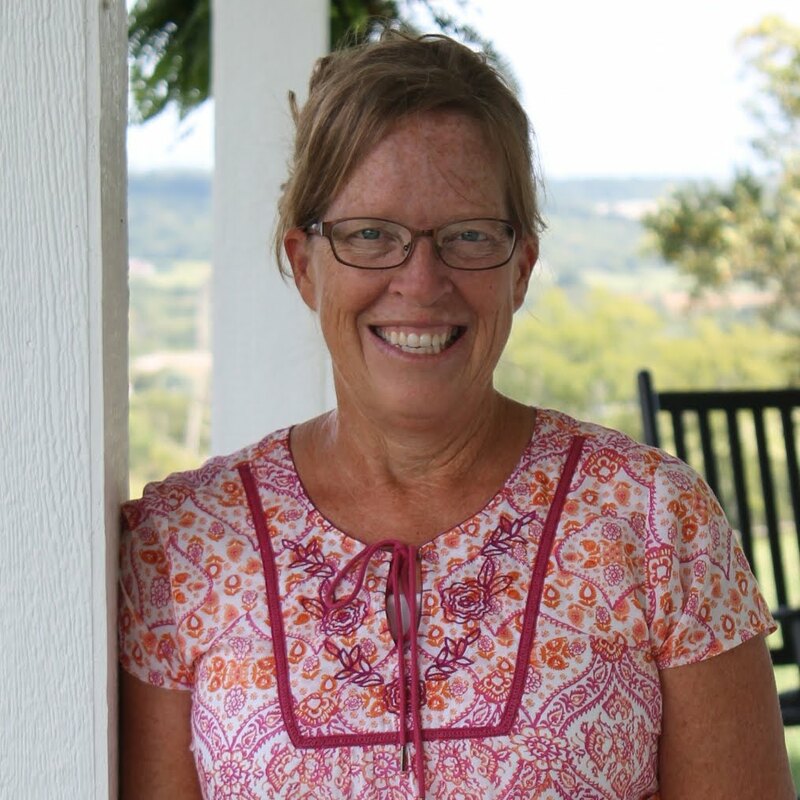 Dori - Love your faucet and your kitchen. That is to be our next big project for this house - remodeling the kitchen. Seth put in a new sink and faucet when we moved in and the faucet is all ready giving me fits. So if I win this would be awesome. :) Always fun to read your progress. Dori, I love yours! I like the fact that has a lifetime warranty, easy to install, and it is heavy. Your house is beautiful and I know you are enjoying it. 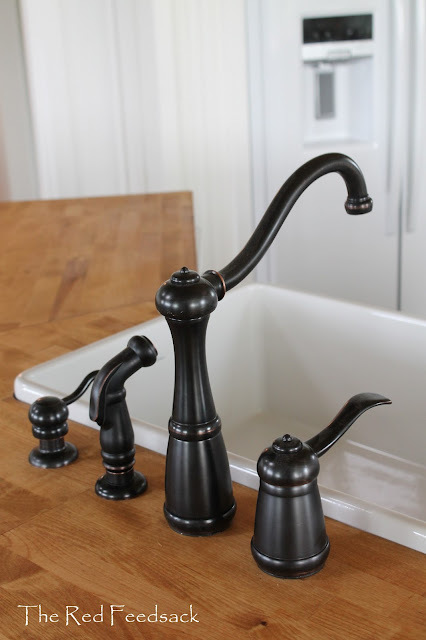 I looked through all the kitchen faucets and my favorite is actually the same one you have! :) We're hoping to buy a house soon and it would be so fun to have a new faucet to go with it. You're right, the Marielle does look perfect in your kitchen. We're glad Eldon approves, too - that's one of the most important aspects of selecting a faucet (we think). Good luck to all of your readers in the giveaway! How did you know I've been looking for a new kitchen faucet? The Ashfield I pull down in brushed nickel would be perfect. 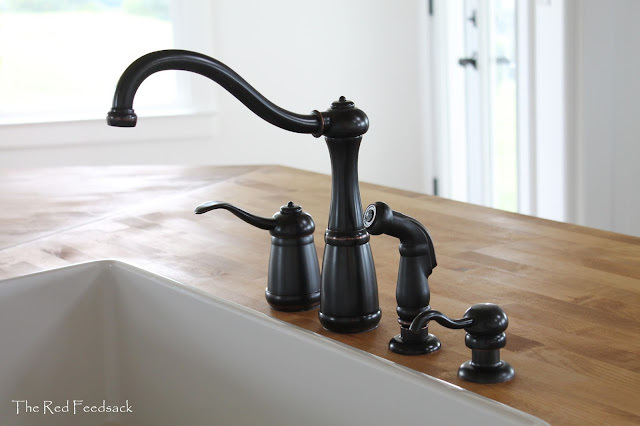 The faucet you selected is perfect for your beautiful new kitchen. Enjoy the results of all your hard work. Thanks so much for offering this give-a-way. I so need a kitchen faucet right now. Mine is broke and it is taped together and leaking. 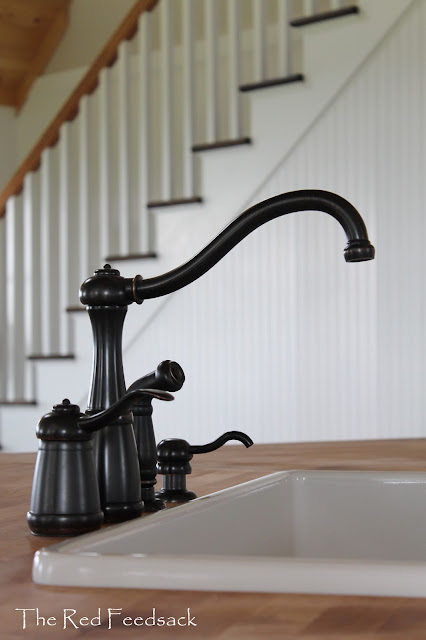 I Love the Hanover kitchen faucet in the oil rubbed bronze. I think the Ashfield faucet in the oil rubbed bronze is my favorite. Your kitchen has turned out beautifully. Love everything. Boy - could I use a new faucet! My pick would be Marielle. Thanks so much for a chance at winning! Amy M.
I love your new faucet. I am definitely in need of a new one and I just love the Avalon for my kitchen. It would match perfectly and be so wonderful to use. I love your kitchen sink and faucet! If I am the winner, I would select Pfirst centerset bath in chrome because we need a new bath faucet. I love the faucet you chose, Marielle. Avalon is also a nice one, I would have trouble picking between the two. I really like your kitchen faucet. Different shape and the color seems to go with any decor. You picked a good one! Love your kitchen. Do you like the separate sprayer? Everyone gets confused on my faucet, how to turn on. I like the simplicity of yours. Think I like the marielle or Hanover. Love your faucet. I liked them all but my favorite is the Pfirst Series with 1 handle pull out. i loved the Treviso 1-Handle, Pull-Down Kitchen Faucet. I'd like in in polished chrome! Love your kitchen! I liked so many, but the Ashfield in chrome was very nice. I love the Alea faucet. I desperately need a new faucet and the Pfister ones are so stylish! I am with you...I love the Marielle!! Thank you for the chance to win! The Hanover 2 handle pull down kitchen faucet in Tuscan Bronze! And my current kitchen faucet is just about to die so this would be perfect timing for me to win!